Instagram Model Tianna Gregory Dating Boyfriend Noah James; Marriage on Cards? Home Article Instagram Sensation Tianna Gregory is In a Relationship with Boyfriend Noah James; Are they getting Married? Instagram Sensation Tianna Gregory is In a Relationship with Boyfriend Noah James; Are they getting Married? Tianna Gregory, one of the hottest model at present is achieving her best with all of her hard work and effort. Her amazing looks, physique, and personality grab everyone's attention and that's the thing that matters a lot being in a modeling career. Her handsome beau is also helping her a lot during her breathtaking photoshoots. Let's get details about her dating life and relationship in today's session. Instagram sensation Tianna Gregory's professional life is like an open book but what about her personal life? She hasn't revealed details about her dating life in public but her love life is definitely not hidden from her fans. She is dating Noah James and their relationship is almost enviable, not to mention, her male fans are somehow jealous of her boyfriend. The adorable couple is having a great time together. Have a look at the Instagram post of Gregory and her handsome beau Noah sharing a passionate kiss while vacationing in Paris. The gorgeous lady repeatedly posts glamorous and sizzling images on her Instagram and most probably James is the one helping her in every other photo shoots. The lovely duo has a wonderful bond. It seems they have been together for so long and there's no sign of break up. It's a happy news for her fans as the couple is engaged! 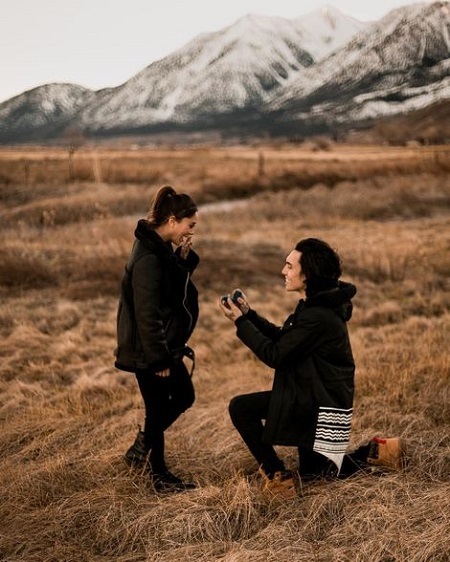 Tianna Gregory engaged to her Boyfriend James. Her boyfriend James went down on his knees in front of her and proposed her with a gorgeous diamond ring. We are waiting for the two get married soon in the coming days. For now, they are enjoying their relationship and giving us all Relationship Goals. It seems happiness is following the way of gorgeous model Gregory one after the other. Tianna who got engaged to her boyfriend recently in March 2019 has a good news for all us. Yes! she is pregnant with her first child! Celebrating Coachella, she shared the very first family photo with her fiance Noah James and their first child in her belly in April 2019. The soon to be mother shared another post flaunting her baby bump. Her post was flooded with exciting comments of her fans who are so excited to know about her pregnancy. Her hot and sizzling Instagram posts raise the temperature and make everyone stunned with mouth wide open. No doubt Tianna Gregory is an Instagram fame personality. Despite her modeling career, she's also busy doing YouTube exercise regimen videos. She has also performed in several music videos. Sources say that she's also busy hosting club parties and many business grand openings. The bombshell also performed in Jason Derulo: Want to Want Me in 2015. Besides, she is also known for The Making of Achawaii48: Anaconda Cove Hawaii 48-hr Bikini Shoot in 2016 alongside Katya Henry. Born on 14 March 1990, in South Lake Tahoe, CA. She stands at a height of 5' 3" (1.60m). She belongs to Italian, Hispanic, German, and Russian ethnicity. She moved to Los Angeles and started modeling for streetwear brands. She earned $42k+ from modeling.